It was just over year ago when my goal was to plant a new thing. I wanted to begin a faith community that was different than the standard church. It was not going to be built on tradition or institutionalism. It was going to be based on mission, on serving Christ and getting out there and doing things. Our goal was to be real, to be relevant to be honest, to be weak and share life with each other. My goal was to be the team leader and make this new faith community happen. That is what I was feeling God was calling me to do. You probably noticed that I didn’t use the word “pastor” or, even though I have the title Reverend, I have always been allergic to those titles. Webster’s defines Reverend as, “worthy to be revered; entitled to reverence.” Um, that’s not me. In fact, I’ve never met a man that I would say deserved to be revered. As team leader my goal was to sometimes teach and other times schedule other people from the faith community to teach or share what they’ve been learning through Scripture. Robin and I had decided that we would not take a salary but instead would work just like everybody else in the congregation and allow all the ministry to happen from the money that came in from gifts and offerings. Please don’t get me wrong. I’m not saying the pastors and reverends shouldn’t have those titles or that they’re doing it wrong. All I am saying is that those titles just don’t make me comfortable.I just don’t feel like they fit me anymore than other people are who are equally deserving of them. I’m a big believer in us all being ministers one to another. Those were my goals: in fact I had even left my church that I served for 11 years to set up and follow Christ on this path. But then on May 2, 2011 everything changed quickly. Suddenly I had brand-new goals. Goals of survival. That’s when I learned that I need a transplant and needed one soon. My goals shifted in an instant. Suddenly my first goal was to be alive when my daughter got married on July 2. After that my goals became holidays and family reunions and maybe my birthday March 20 and then a transplant. I remember being in the hospital on my birthday and so many people commenting on it being a terrible place to spend my birthday. But I didn’t look at it that way, I looked at it as accomplishing a goal because I was still alive on my birthday and had another day to fight. 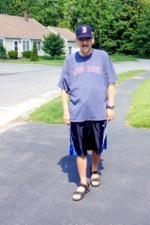 On May 7, 2012 my goal of the transplant was met when my son Joshua donated more than half of his liver to let me live. Forgive me, regular readers, for rehashing so much of this but for those new readers I think it is important to bring you up to speed. My goals have totally changed. Wait, that’s not accurate I do still have the goal of planting a new work. But other goals are much smaller. My first goal after the transplant was to stand unassisted and then I remember my next goal of being able to walk to the bathroom in my room on my own. The next goal was to be a little walk across the hall and back. And then down the hall and then around the corner and then to complete the lap around the whole section. Now, five weeks later, I have the goal of trying to walk around my whole neighborhood. I’m almost there. After that I have goals of attending a wedding and a graduation party or two. One of those goals has already been met another we fulfill on Saturday. 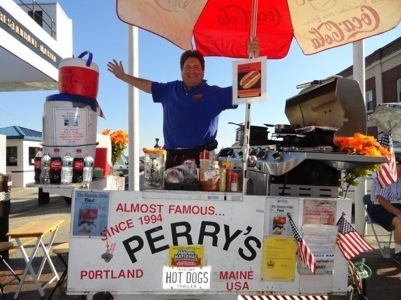 And then by the end of summer I want to get back down to Commercial Street in the old port in Portland Maine to visit my friend Perry of Perry’s Sidewalk Café and grab a delicious kraut dog. In September my goal is to be riding my bike. Beyond that we have goals of family reunion in January or February 2014. I also hope to begin rebuilding my photography business in 2013. We all need to have goals. Something to shoot for. Sometimes we have to set our goals small to take one step or two steps. We have to remember to celebrate when we achieve each goal. What do we do with disappointment when we don’t reach our goals? Well the way I figure it, it’s better to get 50% of a goal set then to get 0% of no goal. Can I encourage you to, whatever crisis you might be facing in your life right now, whatever decision, set goals, start out small and celebrate when you achieve those goals? One said he would start with the tail, one said he would start with the trunk, one said he would start right at the midsection and one said it was impossible. The teacher told them they were all wrong informing them that the best way to eat an elephant is one bite at a time. That’s the secret! No matter what elephant is staring at you, no matter what impossible situation, no matter what unbearable suffering you must face, you can defeat it by taking one small bite at a time and never giving up. I’m praying that my God lets me start a new faith community in the future. That He allows me to teach again. That He grants me the privilege of representing him and telling others about him. Phil 3:12 I’m not saying that I have this all together, that I have it made. But I am well on my way, reaching out for Christ, who has so wondrously reached out for me. Mainers! Go see Perry in front of Domillo’s. Yum! This entry was posted in chronic illness, discouragement, End Stage Liver Disease, facing death, Fatty liver, Fatty Liver Disease, Lahey Clinic, Liver disease, NASH, organ donation, Organ transplant, pain, transplant and tagged Liver, Managing pain, recovery, support, transplant. Bookmark the permalink. That’s because you are an acclaimed wild life photographer and have a love for all animals. Have been thinking of you and praying for you these many months; so glad that God is still in control. Found a letter from you today asking my forgiveness for thinking that I was haughty in my faith. Now, thirty years later, I need to ask your forgiveness for me being somewhat haughty in my faith. In the interim years, life has become real, so has God, and so has my perspective. Thank you for being honest, real and vulnerable in Corbett and in your years of ministry since. I will continue to pray for a quick and complete recovery. I am in Portland frequently and would enjoy a visit when you are up to reminiscing. As I remember you best as Don, you will most likely remember me as Dave, Dave Dave. (Though I have been a singular David for the past thirty years.) God bless. If you can’t place the name, just ask Glenn. Of course I remember Dave, Dave, Dave! Forgiven. Life sure does teach us, huh?